Yoga Teachers | School of Santhi Yoga School in Kerala, South India. We are a traditional Yoga School in India for spiritual seekers guided by Swami Santhiprasad and located in Kerala, South India. To uphold the Indian Yogic Tradition and seriously teach Spiritual Yoga to our students according to the age-old Gurukula System when the Yogic knowledge are passed on in small groups directly from the Spiritual Yoga Master to the students. All School of Santhi Yoga Masters and Yoga Teachers have long teaching experience and are well educated with many years studying the Science of Yoga. 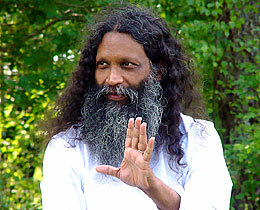 Spiritual Yoga Master and Guru. Our main teacher with over 50 years experience in studying and teaching in the Science of Yoga. 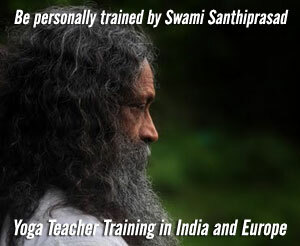 Swami Santhiprasad is one of the 40 Honorary Lifetime Members of World Yoga Council's. Consider the time it will take to get a Visa!